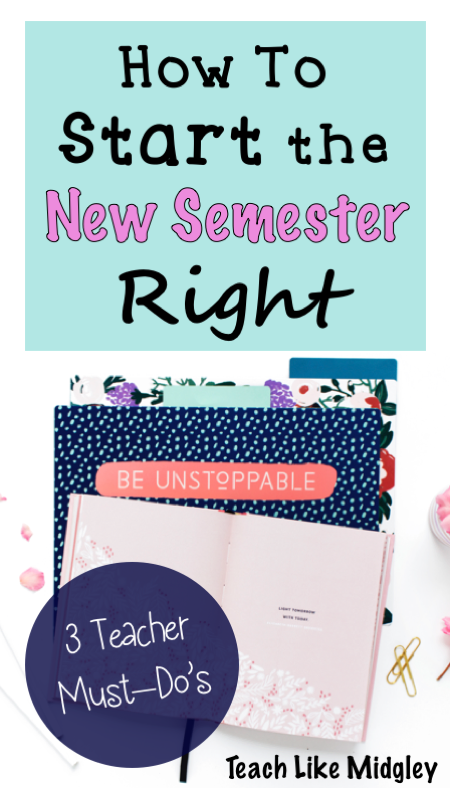 Are you ready for Spring Semester? Ah, winter break! Lots of good intentions – cleaning, organizing, making something new, exercise, getting up early and seizing the day! I must admit, I chuckled as I wrote that statement! As I think about returning to school, I ask myself “what did I do over break?” I got some much needed rest and rejuvenation – that’s what! As much as I would like it to continue – I know that on Wednesday I will have to put my game face back on and head back to work. I am thankful that Wednesday is a work day – a much needed work day to get my brain back in gear before kids come back on Thursday. Think about how the year has gone so far. What has worked well and what has not. Think about procedures and policies. The start of second semester provides the perfect opportunity to re-establish procedures that work and change the ones that don’t. Have students reflect on their year so far. I have my students write goals for each quarter, and then reflections at the end. Perhaps you can take the opportunity to have students write a goal for the remainder of the year. Use this opportunity to re-establish procedures and introduce new and improved procedures as well. #3 – Step things up a notch. You are officially half way through the year. No more getting to know the school, no more learning routines, students are there. You are in full swing of your school year. Challenge them. I find I get the best/hardest work from my students in January. It’s cold, it’s dark, the holidays are over, there’s no place else to be. Time to roll up the sleeves and see what students can really do. I encourage you to take advantage of the new year. Try something new. Challenge your kids – they just might surprise you.